For the native species of New Zealand, European settlement was particularly cruel. The country has no endemic land predators, so many of its birds evolved without the typical avian aptitude for flight. Then came Western settlers, and along with them rats, mice, opossums, stoats, cats, and the occasional misbehaving dog. 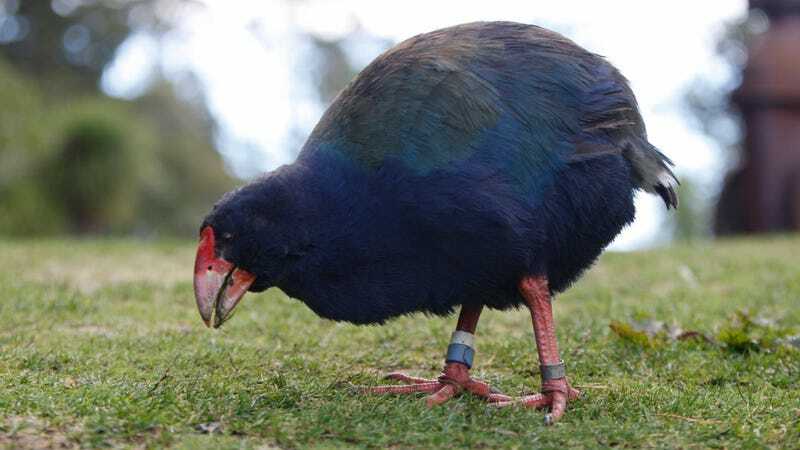 For these invaders, New Zealand’s flightless birds were a veritable feast. Numbers dwindled. Despite conservation efforts, the country still loses about 20 of its namesake kiwi birds every week. Then, in 2014, a young Harvard scientist published a paper that caught the attention of conservationists around the world, New Zealand included. Using the genetic engineering technique CRISPR, he suggested that scientists could create something called a gene drive to override natural selection’s typical 50-50 mix. Among other things, this technique might be used to engineer invasive pests to breed themselves out of existence. No kiwi-killing stoats. Presto. Earlier this year, typically GMO-wary New Zealand signaled it was interested in giving gene drives a whirl. Now, a pair of papers published Thursday suggest there’s just one potentially significant hitch: Gene drives do not appear to be safe to use for conservation—at least not yet. The problem, it turns out, is that gene drives might actually work a little too well. “Our models show that standard drive systems are highly invasive,” Kevin Esvelt, the synthetic biologist who published the original CRISPR gene drive paper back in 2014, told Gizmodo. Gene drives thwart natural selection by creating a “selfish gene” that gets passed down to offspring with more consistency than the rules of inheritance typically allow, eventually—in theory—spreading through an entire population. If New Zealand decided to use a gene drive to rid itself of rats, for example, it’s possible that those genetically altered rats would eventually make their way to other unintended locations, either by stowing away on ships like they did to get to New Zealand in the first place or by other humans not-so-keen on their own rat populations purposefully moving them. “[Modified organisms] probably can’t be safely tested in the field because they’re likely to spread to most populations of the target species throughout the world,” Esvelt said. As you might imagine, genetically altering the world’s entire rat population might wind up being a pretty big problem. The notion of using genetic engineering to thwart natural selection was first proposed in 2003, but it was with the advent of CRISPR and Esvelt’s 2014 paper that the prospect of gene drives seemed within the realm of possibility. The 2014 paper inspired a rush of enthusiasm and fear within the broader public, and spurred a heated debate within the scientific community about whether it would really work. Ever since first putting the idea out there, Esvelt has worked hard to warn the world just how dangerous it might be. He occupies a weird space: a scientist at the forefront of genetic engineering who is also probably the foremost critic of technology he creates. Esvelt, who now has his own lab at MIT, said that the pair of papers published Thursday—one in PLoS, the other as a preprint on bioRxiv—amount to a “mea culpa” of sorts. He said his original paper made a compelling case for all of the potential benefits of gene drives—conservation! eradicating disease!—without spelling out the risks and challenges clearly. New Zealand is not the first place to get excited about gene drives for conservation. In Hawaii, for one, the idea has been floated as a solution to the disease-carrying mosquitoes that threaten native bird populations. Last year, the United Nations Convention on Biodiversity rejected calls for a global moratorium on gene drives, concluding that the potential benefits are too great to not proceed with “carefully controlled field trials.” A report from the National Academies of Sciences gave a cautious go-ahead to gene drives as well. Some recent research has suggested that wild populations will naturally develop resistance to lab-engineered modifications before a gene drive really has a chance to work its magic. In one 2015 study, researchers reported a CRISPR gene drive had allowed an infertility mutation in female mosquitoes to be passed on to all offspring, but as the mutation increased in frequency over several generations, resistance to the gene drive also emerged, making it unlikely for the mosquitoes to invade wild populations. But Esvelt has floated potential ways around this problem, such as inserting the gene drive gene at several important places in a species’ genome so that it’s unlikely to develop resistance. Even with an inefficient gene drive though, the bioRxiv paper suggests a model in which a small number of altered species could spread to unintended populations. The PLoS paper, an opinion piece co-authored with New Zealand geneticist Neil Gemmell, warns that releasing a standard gene-drive is “likely equivalent to creating a new, highly invasive species.” In other words: It could be very, very bad. None of this means anyone is giving up hope on using gene drives as a tool for conservation. It’s just that excitement over the technology got a little ahead of the technology itself. Esvelt and other scientists are working on developing systems that could limit the spread of a gene drive. One potential solution, proposed by Esvelt, creates limits to the number of generations that inherit an engineered trait. Another being developed by a group called the Genetic Biocontrol of Invasive Rodent’s Partnership seeks to find and target genetic sequences unique to a desired population so that the gene could not spread beyond it. The hope is that these new papers move more scientists to focus efforts on designing localized or self-limiting drives that might one day actually have real-world applications, rather than experiment with standard drives that might be too dangerous to ever deploy. In New Zealand, the gene drive is being considered as part of a bold plan announced in 2015 by the New Zealand government to eradicate all wild predators by 2050. Gemmell is part of the team of scientists exploring the use of the technology in New Zealand, and he said the early research can still proceed as planned, alongside work to develop a safer gene drive. There is currently no concrete plan to deploy a drive. Early stage research alone is likely to take years. But, the PLoS paper points out, if any gene drive is ever to be deployed at all, transparent conversations about gene drive technology and its potential consequences need to happen with the public now. In New Zealand, at least, that work has already begun. Predator-Free 2050, a company funded by the New Zealand government, has begun to fund social research into gene drives. The first results were published this week, finding that 32 percent of the 8,000 New Zealanders surveyed were comfortable gene drives, while 18 percent felt they should never be used, and 50 percent were undecided.